The centenary of the Easter Rising, the rebellion that began on Easter Monday 1916, has been marked in Irish towns and cities with wreath-laying events. Synchronised wreath-laying ceremonies have taken place in counties Cork, Meath, Wexford, Galway and Dublin. The Irish capital is also hosting its biggest ever cultural and artistic event called "Reflecting the Rising". It followed a day of national commemoration on Sunday, when hundreds of thousands attended parades. The events have been organised by the Irish government, as a culmination of its 1916 Easter Rising commemoration programme. The 1916 rebellion is viewed as a seminal event in the founding of the Irish state. The Easter Rising was quelled within six days by British troops, but despite its failure it is seen as a significant stepping stone to the eventual creation of the Republic of Ireland and the partition of Ireland. Who were the Rising's leaders? More than 450 people were killed and 2,500 injured during the fighting. A weekend of events to mark the centenary began on Saturday with a remembrance ceremony in Dublin, followed by a military parade through the city on Sunday, which was the largest in the history of the state. Earlier on Sunday, wreaths were laid at Kilmainham Gaol, where 14 of the Rising's leaders were executed, and at the Sigerson Monument in Glasnevin Cemetery, which is dedicated to to all those who lost their lives in the Rising. Monday's synchronised wreath-laying ceremonies were organised by the Irish Department of Arts, Heritage and the Gaeltacht (Irish-speaking areas). They began in Cork on Monday morning, when the acting Minister for Defence Simon Coveney laid wreaths alongside the lord mayors of County Cork and Cork city. Police said that more than 5,000 people attended events in the city to mark the firing of the rebellion's first shots. Wreath-laying was also organised in at Rathcross, Ashbourne, County Meath; Abbey Square, Enniscorthy, County Wexford and Athenry, County Galway. In Dublin, wreaths were laid at various buildings and landmarks around the Irish capital that became focal points during the rebellion. They included Boland's Mill, Jacob's Factory, Dublin Castle/City Hall, The Four Courts, Royal College of Surgeons and Moore Street. 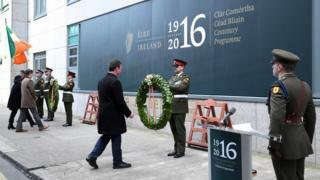 The acting Minister For Environment Alan Kelly laid at wreath at Jacob's biscuit factory. It was one of the largest employers in Dublin at the time and the building was seized by up to 100 members of the Irish Volunteers on Easter Monday 1916. Members of the public who attended the commemoration sang along as a piper played the Irish national anthem Amhrán na bhFiann (The Soldier's Song). Acting Minister for Transport Paschal Donohoe laid a wreath at Bolands Mills, another rebel stronghold that was shelled by a British gun ship - the Helga- during the Easter Rising. A wreath-laying ceremony at Dublin's Moore St was briefly interrupted when protesters heckled the acting Minister for Arts, Heritage and the Gaeltacht, Heather Humphreys. Moore Street is home to the 1916 rebels' final headquarters - a set of buildings where the 1916 leaders escaped to after abandoning the burning ruins of the General Post Office (GPO). Part of the Moore Street site has been preserved as a national monument but Ms Humphreys had recently been criticised by campaigners who want the protected site extended. It features music, drama, poetry readings, history tours, and exhibitions, with the aim of telling the stories of 1916 and recreating some of the sights and sounds of that year.